The Wall Street Journal ran an article a couple of months ago about the difficulty in finding technical support for ageing Aibos now that Sony has discontinued support for them. Ritsuko Kobayashi has been organizing the monthly get-togethers in Kawasaki since 2003. Originally, she says, the idea was to let Aibo owners meet in a relaxed setting where they could help one another program the robots. Mr. and Mrs. Matsui met at a similar gathering in Kyoto in 2001. Now that Sony no longer offers technical support, the meetings have taken on a more vital role as a place where owners can help each other with repairs. Aibo owners say a thorough overhaul is necessary once a year to keep the robots functioning properly. The weakest link, many owners say, is a leg joint that can fail, preventing the dogs from walking or even getting up. Read the full article at http://www.wsj.com/. Sony’s robotic dog, named Aibo, was launched way back in 1999 and finally discontinued in 2006, but many of the 150,000 Aibo live on inside owner’s homes. Except they’re getting old, which means some are coming to the end of their lives. The pictures you see above are from an Aibo funeral, held in the Chiba prefecture in Japan. The little robotic dogs are accompanied by engineers from A FUN, a company specializing in Aibo repairs, but these Aibo are obviously beyond even expert help. Each one has a tag with the owner’s name and the place from where they came written on it. 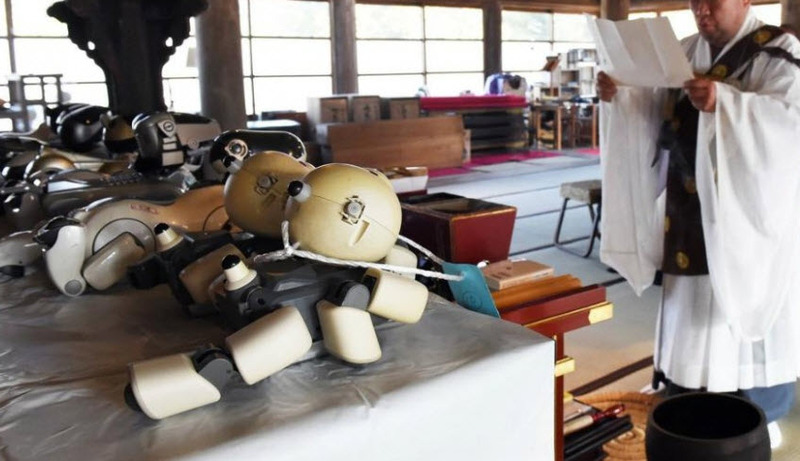 The head priest of the temple prays for the 19 Aibo dogs, and says it’s to aid the robotic souls in passing from the bodies. As the AIBO is now discontinued you can not buy any new ones. Anywhere. That means that the only chance you have of buying an AIBO is on Ebay or similar auction site. However, there are a number of scams on Ebay so you should be careful when looking for an Aibo for sale, although there aren’t as many as there were when the AIBO was still available to buy new! Take a look at our pointers below and also read this post on the AIBO-Life web site. To see what AIBO and AIBO related items are currently for sale on Ebay click here. 1. The seller will usually have no (or very little) eBay feedback. Disco AIBO is a piece of software built using RCODE/RCodeplus by Aibo Pet that makes your AIBO dance along to songs played from your computer or stereo. It consists of 23 songs that are recorded with a trigger tone at the beginning of them that tells the AIBO to start dancing. Some of the dances have multiple parts, for example a singer and back-up dancers doing separate routines. You can download the software from AiboPet’s site and there are full instructions on how to install and play it there as well.